As one of New York's Oldest Active Sportsmen's Clubs, it's only appropriate that we preserve some of our rich history for all to see. While established in 1884, our State of New York, Office of the Secretary of State, sealed certificate certifies that the Certificate of Incorporation of The Saugerties Fish and Game Club Incorporated was filed and recorded on the sixth day of August 1912. Saugerties Fish & Game Club, Inc.
"The Right Of The People To Keep And Bear Arms Shall Not Be Infringed"
This brief work is an attempt to put together a history of the Saugerties Fish and Game Club, Inc. The club was formed in 1884, as this is the first documented record. A membership book with a list of 58 people indicates the names and yearly dues of 50 cents (It's assumed these are yearly dues, but may be monthly??). To place in perspective the beginning of the club, it may help to show it in a historical context. The Town of Saugerties was incorporated in 1811. The American Civil War ended in 1865. Chester Arthur was President in 1884 and the Saugerties Town Hall was built in 1890. So, the Club was founded 19 years after the War and 6 years before the Town Hall was built. The members who founded the club consisted of industrialists, shopowners, attorneys, doctors, craftsmen, saddlemakers and newspaper publishers, etc. A list of the club founders reads like a Who's - Who of Saugerties. Some of the members included: Thomas S. Dawes, Village Mayor 1884; Uriah Van Etten, Town Supervisor 1884; O.T. Simmons, Village Mayor 1883; Wm. R. Sheffield, owner of Sheffield Mills (old Barclay Paper Mill); Edw. Jernegan, editor of the "Pearl" and publisher of the "Daily Post"; G.W. Elting, owner of the "Saugerties Press"; L. Zeigler, Capt. of the first Saugerties Rowing Club; P. Cantine, attorney; Wm. Kipp, saddlemaker; T.S. Dawes and E.D. Chipman, physicians. Also, Wm. Sheffield and T.S. Dawes started the first "circulating library". Geo. Seaman was Treasurer of the Saugerties Saving Bank. This is just a sample of the background of some club founders. The early history of the Saugerties Fish and Game Club is quite sketchy. Most documents, membership lists and club minutes have been misplaced. There are some records dating into the 40's (i.e. Report of Harold Mills, 1946). Membership lists and meeting minutes starts to become more available from the 50's to the present. For many years the Club held its meetings where ever it could find a place. Early meeting places were (not in chronological order): Broomies Tavern (shooting range in basement), "Bathing House" on Esopus Creek, Snyder Hose Co. rooms, Centerville Tavern, Berzal's Garage and in members houses. Club records indicate that the search for a permanent site began in the 50's. A notation in the minutes indicates that a parcel was "possibly going to be donated", but it was squashed by the owner's son because "the parcel was worth too much". In 1963, land on Fish Creek Rd. was donated to the Club by Percy Mower. A second parcel was bought from Percy (for a low fee), upon which the present clubhouse stands. These two parcels totaled about 75 acres. The original section of the club house was an "old shed" donated by St. Mary's Catholic Church and hauled up the hill by Club members. Some of the members who were involved remember lanterns being hung from the corners and telephone wires over Fish Creek road being so low that members held them up with sticks. It's rumored that the shed was almost lost from the trailer as it was coming up the hill!! The right-of-way where the current road is built was obtained from Mr. & Mrs. George DeMare. Saugerties Fish & Game Club has a long and proud tradition. Thousands of members has have donated time, material, land, money and vision to make this one of the best fish and game clubs in the state. From its roots in 1884, the Club was believed to be the oldest active fish and game club in N.Y. State. In part, the Club constitution reads as follows. To create and foster public sentiment in favor of the conservation of fish and game. To promote safe hunting and fishing practices and shooting sports. To aid in the enforcement of fish, game and environmental laws. To encourage a proper respect for the rights of land owners upon whose land it may be necessary to go in the furtherance of the previous objectives. The club also remains diligent in disseminating information to members with regards to legislation that may affect conservation or the shooting sports. We must remain for ever diligent in following the legislative process to make sure that what is "said" is also "done" by those whom represent us at a national, state and local level. a) Two (2) trap fields. With concrete pads and seeded infield. The "upper trap field" has a automatic trap. b) 12 covered shooting points for pistol and rifle. The pistol firing points can be enclosed & lighted for winter or night shooting. c) Archery range with practice butts and with a state-of-art wandering range that contains both silhouette and 3-D targets. 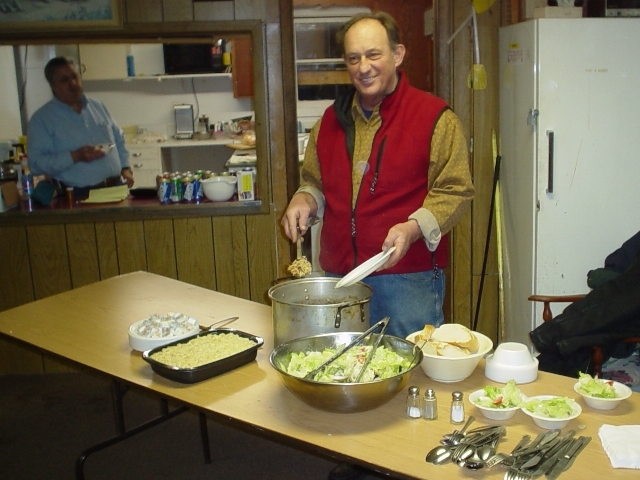 d) The club house is rustic and serves as a site for membership meetings, dinners, and other activities. e) In addition to the land on the club proper, other lands are posted on Peoples Road and in Asbury. Total land available to members for hunting is in excess of 200 acres. 1) Listing of names are sequential as listed in the membership book. 2) _ _ _ _ _ indicates that a letter or complete name couldn't be read so isn't listed below. 3) Also, some names that are listed may still not be correct as listed below. This is the compilers "best shot". 4) An * before a name indicates a probable Civil War Veteran. The name was found under Civil War Veterans in "History of Ulster County", but more research is required to actually verify the Civil War status. At the end of the 1884 membership book there is an entry with the following names: AARON HANNA, A.A. POST, T.S. DAWES, J.O. BEERS, GEO. W. ELTING_ (and then) adopted April 18, 1884. It's assumed that these are the first Club Officers. The following is an attempt to recognize past club presidents. They are listed by approximate era. Some/many are missing. 1 or 2 may not have been president, but it's best to err on the side of inclusion. Names are not necessarily listed in order of service. Some may have served for more than one term and may have overlapped years/era. Names before 1940 are not available as of this printing. I started putting together this history during the last week of August (1994) for the club's 110th Anniversary Celebration being held on Sept. 16, 1994 at Pollaces in Catskill. There is much more work that could be done to fully document the history of Saugerties Fish and Game Club. This work will be left for future anniversaries. I spoke to a number of members in compiling this material. A number of past presidents gave me information on those presidents that came before or after their term(s). Some members shared stories with me about club "happenings" and I wish there was time and room to relate these, but there isn't. I want to thank those people for their help!! I would like to specially thank the following for taking extra time to give me information: Roy Longendyke, Casper "Cookie" Miller, Len Sperl and Will Sperl. Also, a thanks to Bruce Freligh for the front page layout and artwork. The backgrounds of our founding members was found in the "History of Ulster County" at the Saugerties Library. 6/29/1999 minutes state: "Fred Faerber, former president of the Federation, presented a framed copy of the club's 1946 Yearly Report to the club during the anniversary banquet." We plan on reproducing at least portions of this report here also. 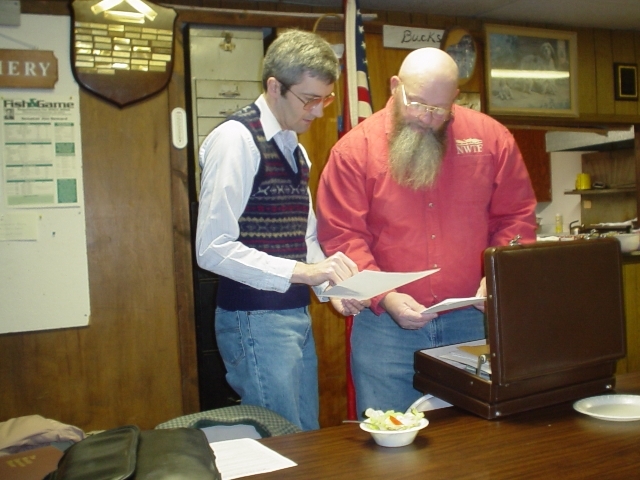 Brett (Secretary) & Larry (President) reviewing notes before the Meeting. Because we are digging into the archives as time permits, you'll want to check here again for more of the legacy left for us since 1884. This page last updated at 16:19:14 EST on January 14, 2006.